Thoughts on Post Graduate study from Rachael Camp. 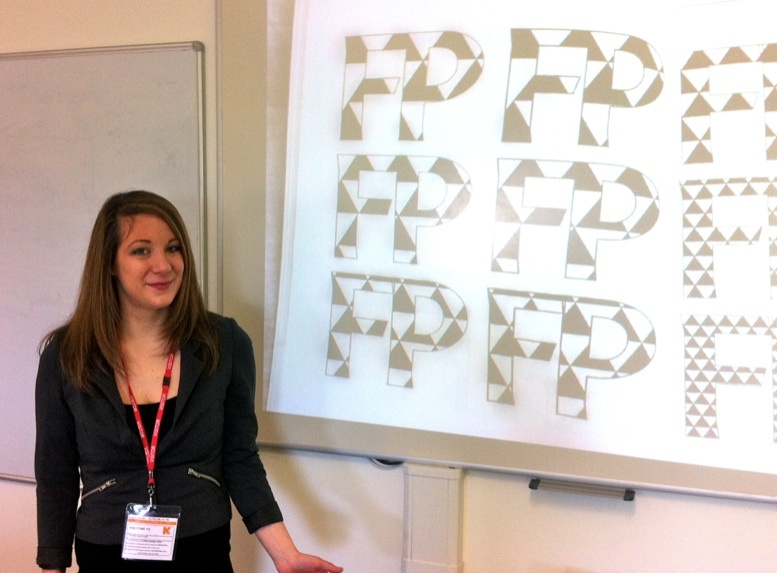 Former Kent Graphic Design student Rachael Camp discussing the pros and cons of postgraduate study. t K College this week, we were pleased to have with us one of our former students who has recently undertaken post-graduate study and who kindly visited us to share her experiences with our current cohorts. Rachael Camp studied with us for both her HND and BA (Hons) degree. Whilst completing her degree, Rachael then decided that she would like to undertake further study. After researching her options, she opted for the London College of Communication’s (LCC) MA in Graphic Design. The intense experience of post-graduate study had a significant impact upon Rachael’s approach to graphic design, affording her the opportunity to explore topics in greater depth than ever before. Rachael gave some good advice and outlined the pros and cons for anyone considering post-graduate study. Rachael noted that finding time was particularity difficult. Despite Rachael’s complete commitment to the course, she admitted that studying part-time would have been easier than full-time. Most MA’s are quite intense and time isn’t in abundance if you have to work to self-fund and in such a short time. In this case just one year! There’s a lot to be done. Rachael showed us the physical output of her year’s work and it included a great deal of printed books, reports and brochures—all of which had to be paid for out of her own pocket. Then there’s the written work. For Rachael’s course, this could be anything between 7000-12,000 words for an essay. Needless to say that this doesn’t leave much time for a social life. As well as feeling a huge sense of accomplishment, Rachael picked up on positives such as having some eminent tutors and guest speaks whose lectures came highly recommended. She also felt that the MA was a great place for networking, particularity as it is situated in London. So then, post-graduate study is not something to take lightly. It takes enormous amounts of self-imposed dedication and hard work, but for those who stay the course, it’s well worth it. We’d like to thank Rachael for taking the time to come in and talk to us, and we wish her every success in her future endevours. The original post can be seen here at Graphic Design Kent and Rachael’s portfolio can be seen here.